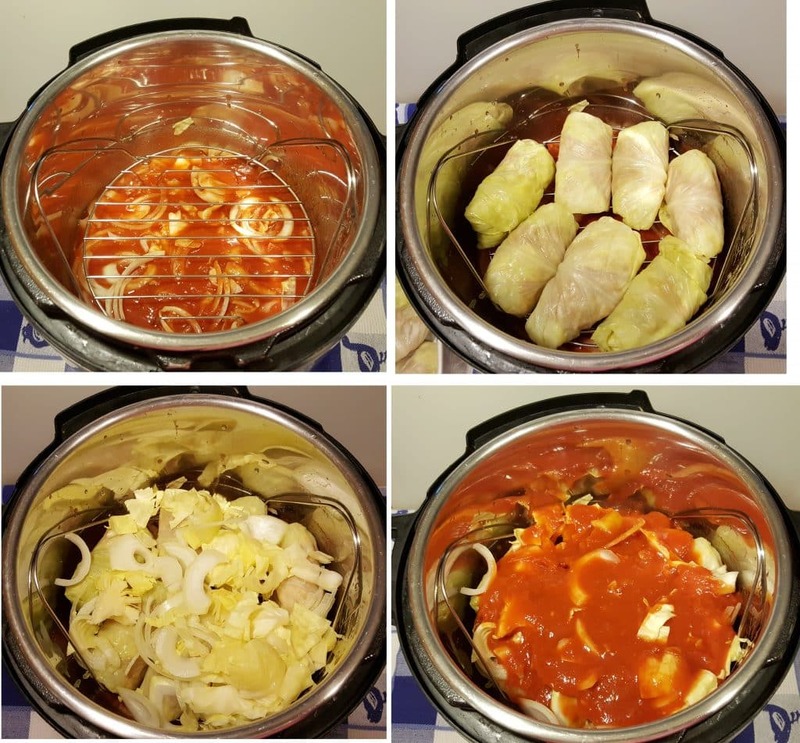 Instant Pot / Pressure Cooker Jewish Sweet and Sour Stuffed Cabbage Rolls are a traditional dish made with a tomato onion sauce, but now has less than one hour cook time! 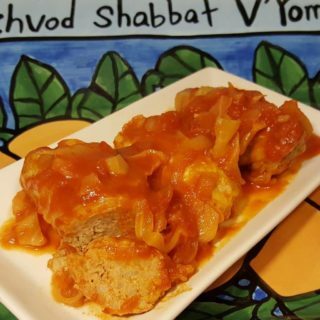 Jewish Style Sweet and Sour Stuffed Cabbage, also called Holishkes, has been a staple of Eastern European Jews since the 14th Century. Ashkenazi Jews everywhere have their own special recipes and traditions. My first memory was around 1969, maybe a bit before. Every Winter, my Grandma, Rose Selkowitz, drove to Florida and stayed at either the Eden Roc Hotel or the Fountain Bleu, until the end of Spring. Back then, it was very affordable for average citizens to stay in fancy hotels. I remember sitting around a very long table in her hotel room, having a meal. Perhaps it was Sukkot. Jews eat a lot of Sweet and Sour Stuffed Cabbage during Sukkot. As a kid, I wasn’t very thrilled with the meal as I did not learn to love vegetables until later in life. As I got older, I developed a real love for my Grandma’s Jewish Sweet and Sour Stuffed Cabbage Rolls. A minimum of three hours simmering is a long time. However, with my wonderful Pressure Cooker, my Pressure Cooker Jewish Sweet and Sour Stuffed Cabbage, only takes about 15 minute cook time. Of course, make sure to take into account the time for the Pressure Cooker to come up to pressure and then the 15 minutes for the pressure to release. So, 30-45 minutes sounds a whole lot better than 3 hours on the stove and/or in the oven. Before preparing the Meat Filling and Sauce, start the Cabbage. Just a minute in your Pressure Cooker on a Trivet with a little water underneath, is all you will need. After pressure is released, run the Cabbage under cool water, so that you can handle it, with ease. Using a sharp knife, remove the core, a little more than an inch down and about the same difference around. Ever so gently, remove each Cabbage Leaf, until you get down to the white center. For this recipe, 16-18 Cabbage Leaves should be enough. 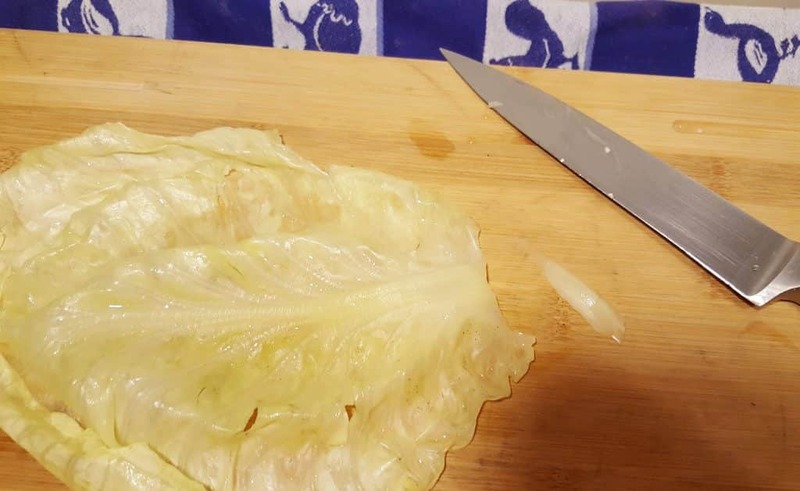 Take a sharp knife and shave off the thick vein at the very bottom of each Cabbage Leaf, being careful not to poke through the Cabbage Leaves. You just need a tiny bit removed, which will make rolling up the Cabbage, much easier. Ground Beef is what is mostly used in Jewish Style Sweet and Sour Stuffed Cabbage. 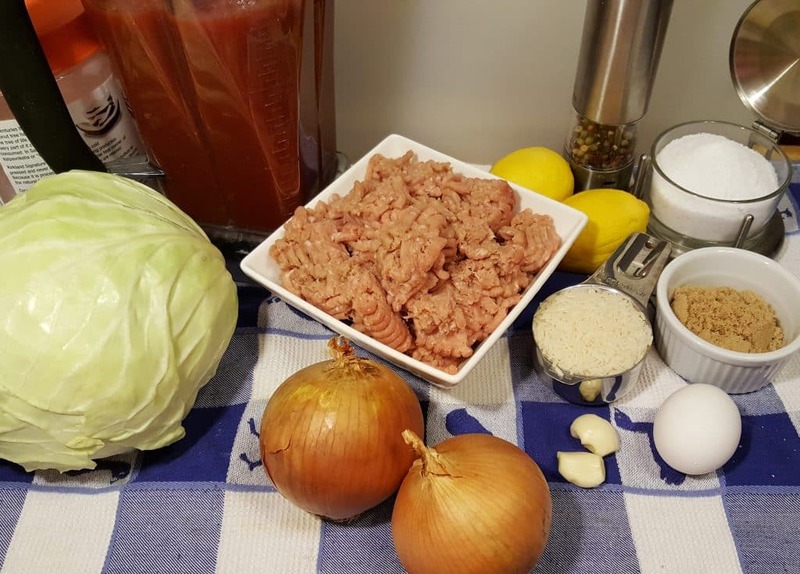 I like to use Ground Turkey in place of Ground Beef in most recipes and I use it my Stuffed Cabbage. For me, weight measurements are easier and I only have to dirty one bowl, but feel free to measure however you like. 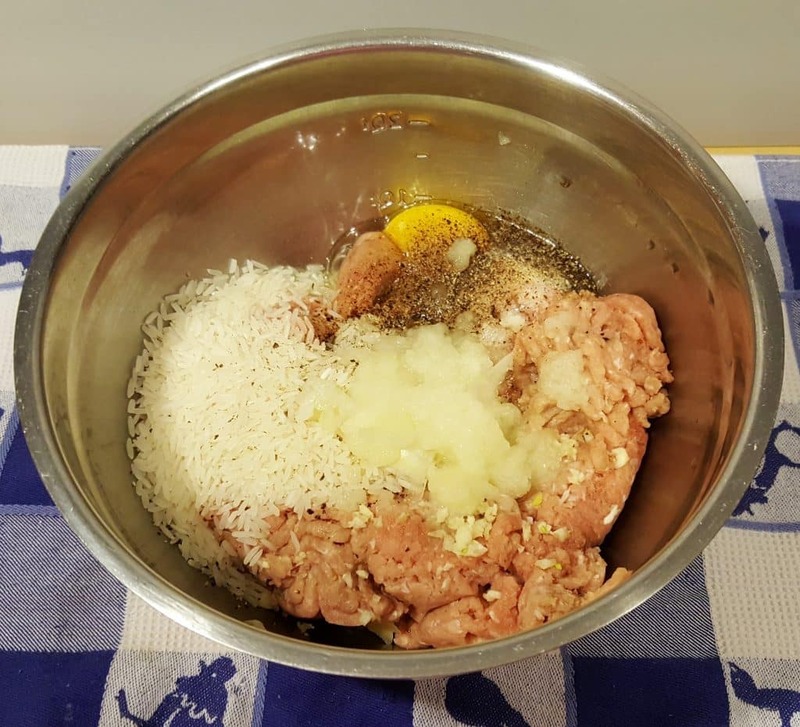 In a Medium Mixing Bowl, add your Ground Beef or Turkey, the egg, Raw Rice, Seasonings. Back then, we didn’t know from rice, but remember the long grain is nicest in this recipe. Now I use Long Grain Jasmine Rice. To get some good Onion flavor without chunks of Onion, take a Good Course Grater and grate up about 1/3 of an Onion. The rest of the Onion(s) will be sliced and used between the Cabbage Roll layers. ***** If you prefer to use Brown Rice, add the Raw Rice to the Pressure Cooker cooking pot when you cook the Cabbage Rolls. Then strain out the water and use the par-boiled BROWN Rice!!!! If using Ground Turkey, add in a big shot of Worcestershire Sauce, to boost up the taste. You can add a shot of Worcestershire Sauce to the Ground Beef too, if you like. It is a wonderful flavor enhancer. Combine the ingredients well. Use your hands, it is fun. 🙂 This recipe is a great family recipe, as everyone can help. Set aside the Meat Mixture and prepare the sauce. 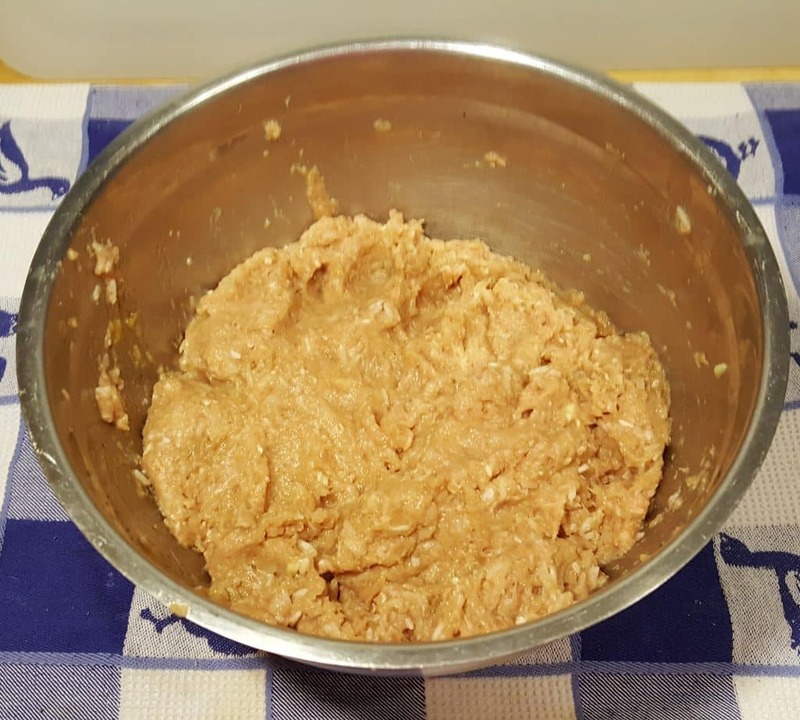 The photo of my Meat Mixture looks kind of nasty, I know. Ground turkey is softer, wetter and mushier than Ground Beef. You have several options for the Sweet and Sour Sauce. To make it easier to mix AND to pour, I like to use my Vitamix or Kitchen Blender. You will want about 6.5 cups total, so keep that in mind. Start with two 11.5 oz cans of Pure Tomato Juice (or 1/2 of a Large Can) (when I make a double batch, I use my 8 Quart Pressure Cooker and the Large Can). Set aside one cup of the Tomato Juice. 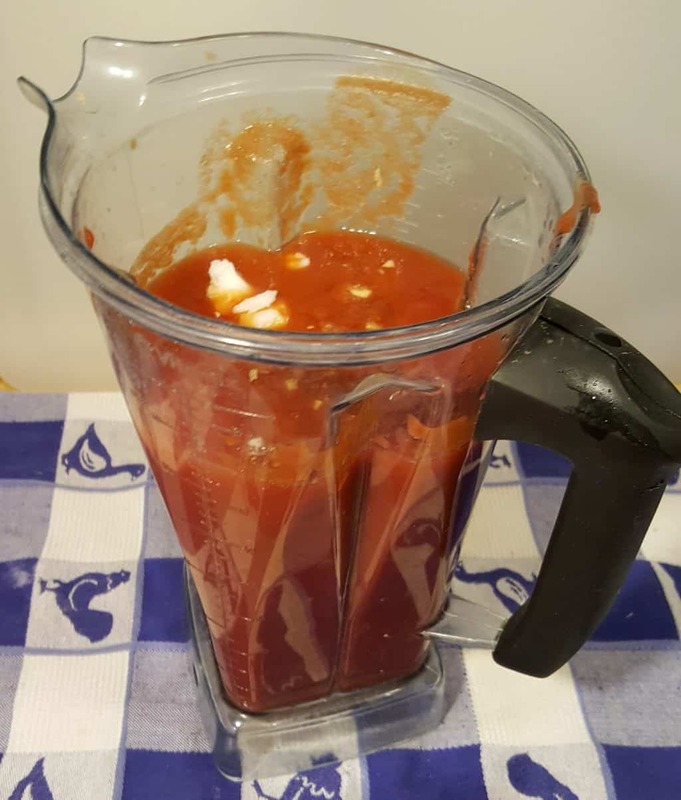 Add the rest of the Juice and the Tomato Sauce to your Vitamix or Kitchen Blender. Add the Fresh Squeezed Lemon (or True Lemon, if you like), Brown Sugar, Salt/Pepper, Garlic and Oil (Coconut, Crisco Shortening, or Vegetable). Process just enough, so that the Seasonings are mixed through. If using Canned Whole Peeled Tomatoes, add them into the Vitamix or Kitchen Blender and pulse/process just for a second or two. You want texture!!! If using Pureed Tomatoes, dump them into the Sauce Mixture and hand mix with a spoon. Don’t process them in Blender. If you like more texture, use Diced Tomatoes. Clear off a space on your Counter for your work station. You will need the Meat Mixture, a Cookie Dough Scoop and the separated Cabbage Leaves. If you are comfortable using your hands, use your hands. I know my Grandma did. But, me being a bit OCD, I use my Cookie Dough Scoop to scoop out the Meat. The photos above will show you how to make the Pressure Cooker Jewish Sweet and Sour Cabbage. Take one Cabbage Leaf and place it vein side down, with the base closest to you. Add a large scoop of the Meat Mixture to the base of the Cabbage Leaf. Fold in the sides and then roll up the Cabbage Leaf, folding in the sides as you go. If there is excess Cabbage on the sides, tuck the excess into the sides. Slice up the rest of the Onions and Chop up the rest of the Cabbage, which includes the center, whiter part and any unused Cabbage Leaves. You are now ready to add all the ingredients to your Pressure Cooker. As we all know, tomato products tend to scorch and burn easily. Therefore, we will make a buffer, so that nothing will burn or scorch. 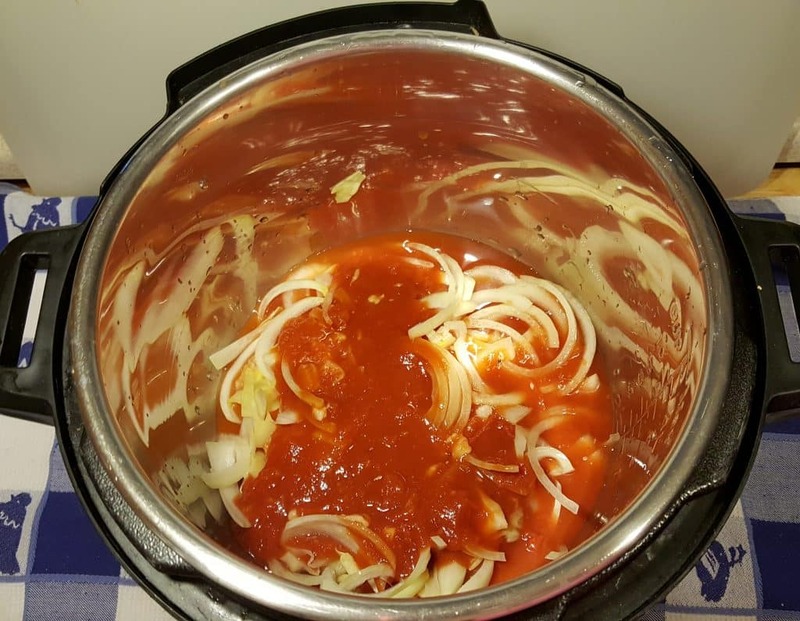 Place a big handful of the Cabbage and the Sliced Onions into the bottom of the Pressure Cooker, so that the bottom is covered. 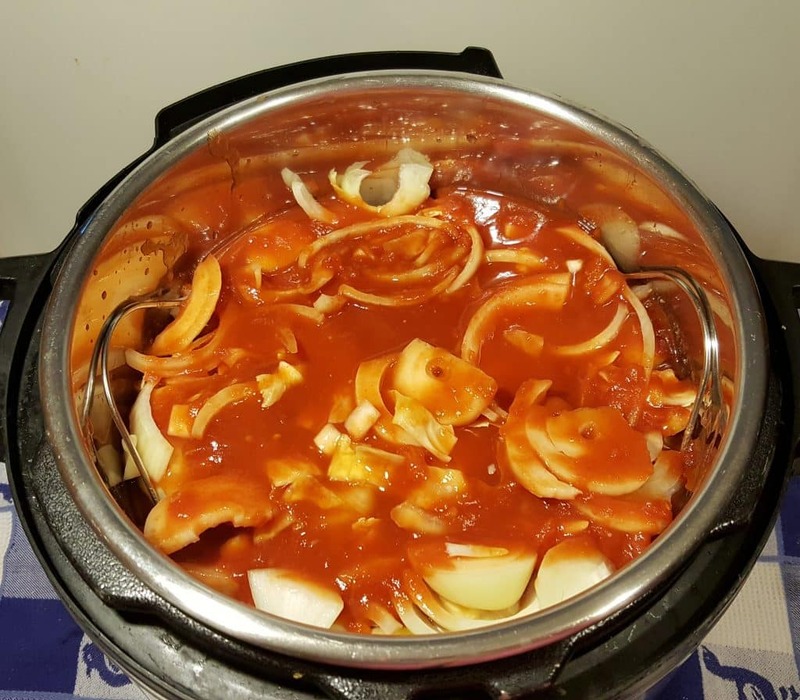 Pour the Tomato Juice that was set aside over the Sliced Onions and Cabbage. Place a Short Legged Trivet into the Pressure Cooker, on top of the Buffer Layer. 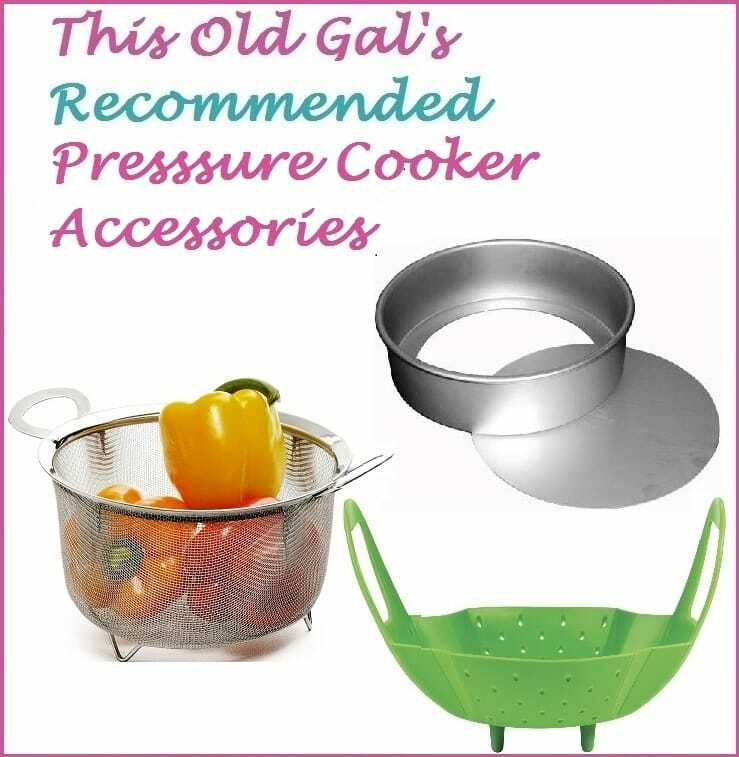 This will help prevent the Tomato Chunks from falling through to the bottom of the Pressure Cooker cooking pot and will allow the Pressure Cooker to reach pressure, without the worry of burning and scorching. Add in half the Stuffed Cabbage Rolls. Place half the Onion Slices and half the Chopped Cabbage on top. If you are doubling the recipe and using an 8 Quart or larger Pressure Cooker, you can do three layers and divide everything into three, rather than two. Pour some of the Sweet and Sour Sauce over the Cabbage Rolls. Add the second layer of Stuffed Cabbage Rolls and the rest of the Sliced Onions and Cabbage. Pour on the rest of your Sweet and Sour Sauce. The really thin part of the Sweet and Sour Sauce will fall to the bottom and the thicker part will stay on the top. Some people top with Raisins and/or crush Ginger Snaps, or even Candied Ginger. There is some room for a tiny third layer in the 6 Quart Pressure Cooker really, but I tend to go less, than more. Plus, there is just two of us. Plus, plus, the rice will puff up and your pot will look more full than when you started!!! You will end up with a lot of extra Sweet and Sour Sauce, but don’t worry. It is soooo good. We freeze the Sweet and Sour Sauce in 24 oz Reditainers and then use it as a dipping sauce and/or a cooking sauce for other recipes. For example, as an alternative to the Sauce used in my Pressure Cooker Friday Night Shabbos Brisket. A Sweet and Sour Brisket is to die for!!! 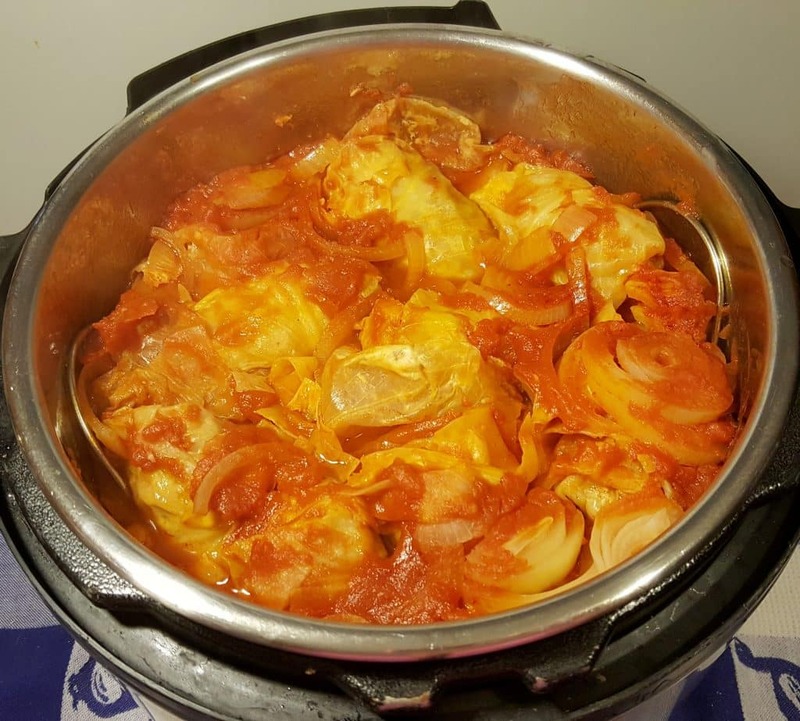 A Whole Pot of Sweet and Sour Stuffed Cabbage! 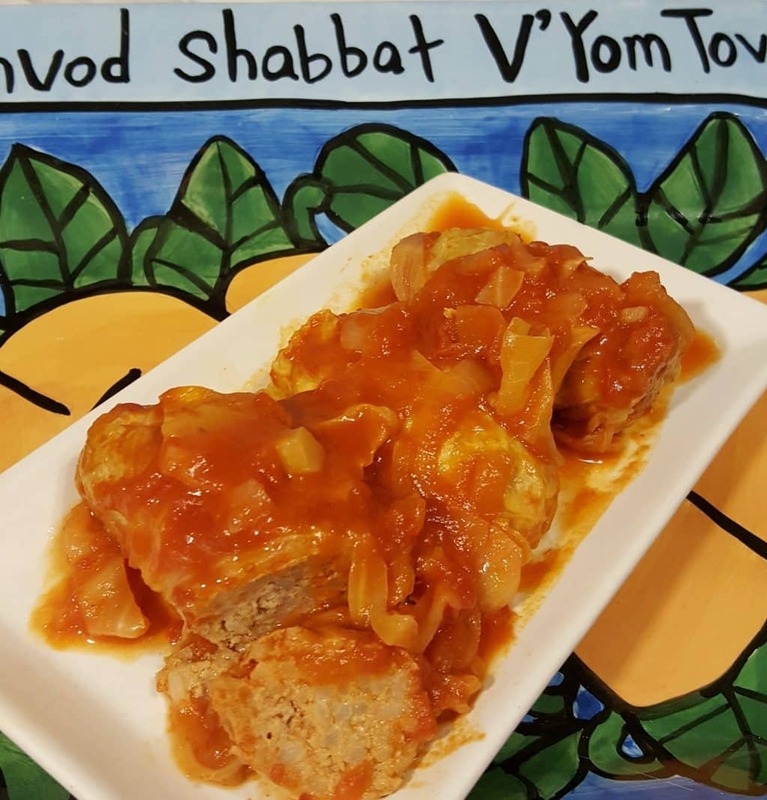 Using the Pressure Cooker to make this Pressure Cooker Jewish Sweet and Sour Stuffed Cabbage, is seriously a game changer. 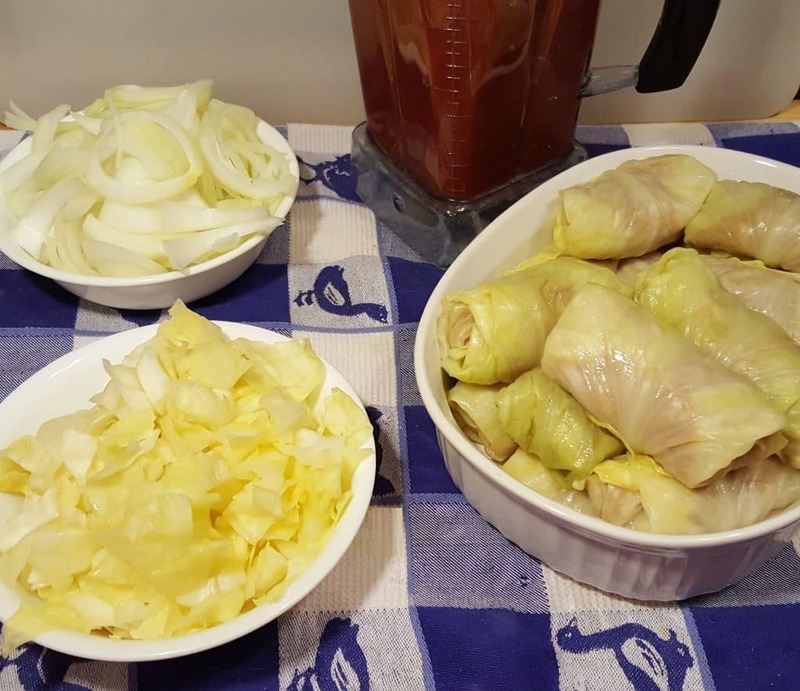 The Instant Pot Cabbage Rolls self baste and no slaving over a hot stove. It frees up your oven to bake some Yogurt Whey Dutch Oven Crusty Bread or other baked goods and takes up such a small space. 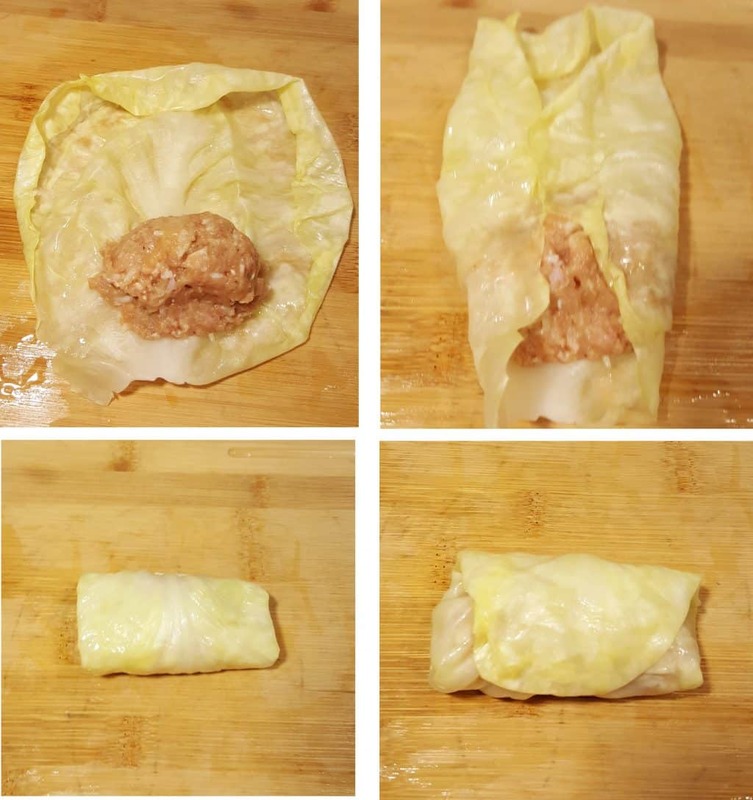 Your Cabbage Rolls can be tucked away inside your Pressure Cooker, in the corner and can be cooking during the four questions or while your guests are enjoying appetizers. With a slotted spoon, remove all the Stuffed Cabbage Rolls and plate. Add a few big spoonfuls of the Sweet and Sour Sauce over the top. Serve as an appetizer to your Passover Dinner or as a Main Course, any time! This is a treif recipe, so if you keep Kosher, plan accordingly. 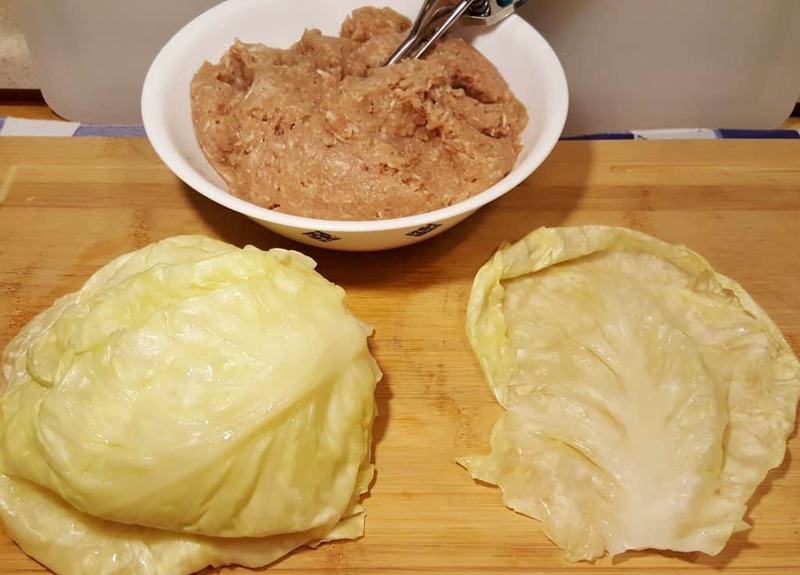 For non-Jews, this Pressure Cooker Jewish Sweet and Sour Stuffed Cabbage would not be served with my Jewish Noodle Kugel (Noodle Pudding). It would go well with my Pressure Cooker Friday Night Shabbos Brisket recipe. I couldn’t remember my Grandmother’s birth year, so I typed in Rose Adler Selkowitz. Much to my surprise and astonishment, I came across a question asked 15 years ago in a Jewish Group. It talked about my Grandmother and Grandfather Jack (who died the year before I was born) and family members, including me. The note was signed by my dad, who dies in 2005. If that doesn’t take your breath away. I also discovered that my last name is really Zelikowitz. Add 1 cup Water to Pressure Cooker cooking pot. Place Cabbage on a Trivet. Lock the lid and close the pressure valve and cook for 1 minute. Allow a 5 minute Natural Pressure Release. 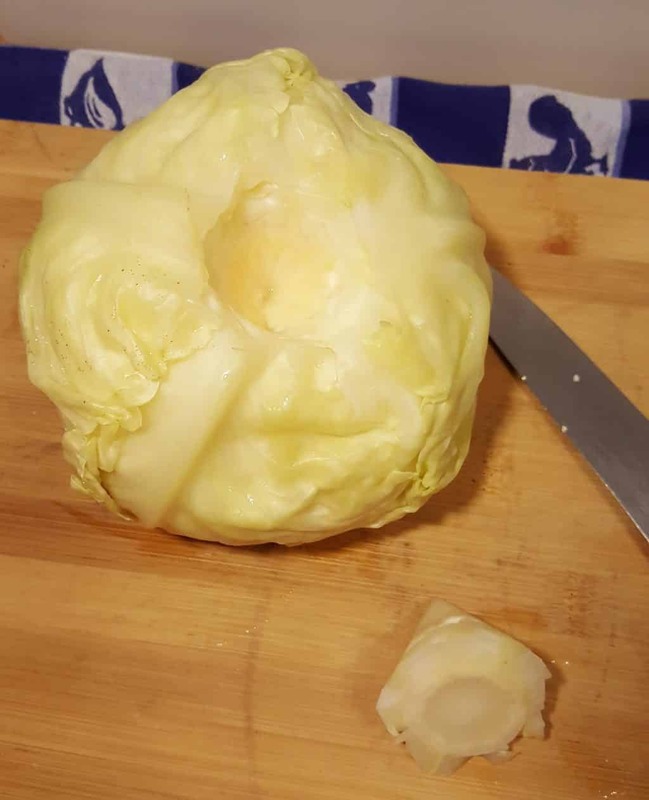 Remove Cabbage from Pressure Cooker and run under cold water to cool. Dump out water from Pressure Cooker and rinse pot. Place cooking pot back into Pressure Cooker. Remove Cabbage core. Carefully remove 14-20 Cabbage Leaves. Gently, shave off the raised/thick part of the vein at the base of each Leaf. Set the Leaves aside. Chop up the rest of the Cabbage (which is white-ish) and set aside. Add all Filling Ingredients to a Bowl. With a Hand Grater, grate about 1/4 cup of Onion into the Bowl. Mix together well. Set aside. Slice the rest of the Onion(s) and set aside with the Chopped Cabbage. Take one Cabbage Leaf at a time and add a small handful of the meat mixture. Fold in sides of Cabbage Leaf and roll up, tucking in the sides as you go. Repeat until all Filling has been used. Place 1/3 of the Chopped Cabbage and Sliced Onions into the bottom of the Pressure Cooker cooking pot. Pour in the one cup of Tomato Juice. Place Short Legged Trivet in Pressure Cooker cooking pot over the Buffer Layer. Place half the Cabbage Rolls on Trivet. Add a layer of Onions/Cabbage and pour over half the Sauce. Add another layer of Cabbage Rolls, top with the rest of the Onions/Cabbage and Sauce. Lock on Lid and Close Pressure Valve. Cook at High Pressure for 9 Minutes. When Beep sounds, allow a 15-20 minute Natural Pressure Release. With a Slotted Spoon, remove Cabbage Rolls to a plate and pour over the Sauce. 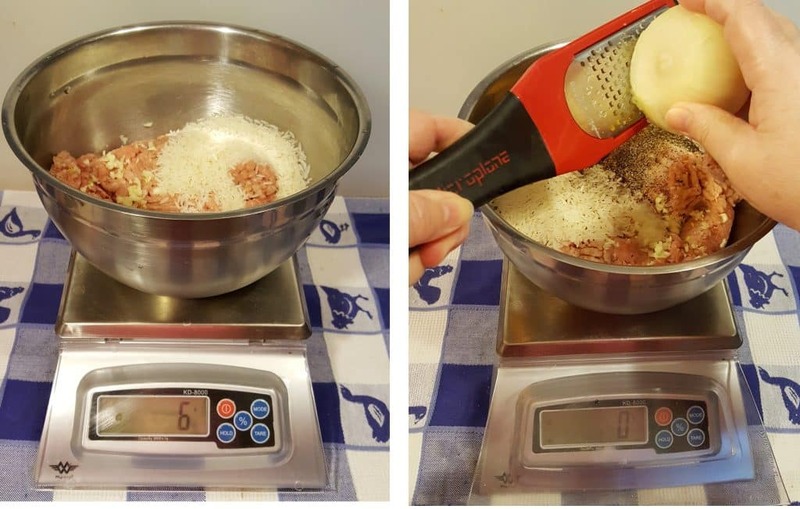 Table Salt/Sea Salt is twice as potent as Kosher Salt, so if you use Table Salt instead, cut the amount. Some people top with Raisins and/or add crushed Ginger Snaps, or even Candied Ginger to the Sauce. If using Brown Rice, add the Raw Rice to the Pressure Cooker cooking pot when you cook the Cabbage. After pressure is released, Strain out the water and add the Brown Rice to the Meat Mixture. 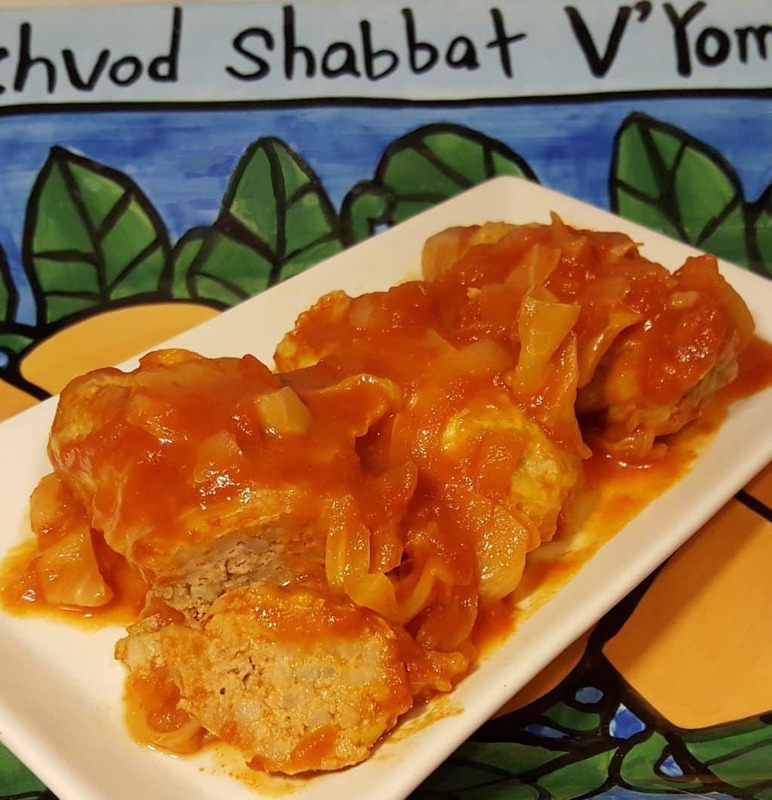 PIN this Pressure Cooker Jewish Sweet and Sour Stuffed Cabbage Holishkes! Made these for family on Easter, everyone raved how good and delicious these were, they were so moist they cut with a fork! I can’t wait to make this. Thank you Jill. These look amazing. Since we don’t eat white rice, is it possible to substitute brown rice? If so, what adjustments would I need to make if any? I almost used brown instead of the white. It definitely can be done. I used white, to do it the way my Grandma did and it is delicious with the brown. Add the rice to the water when you cook the Cabbage and then drain out the water and use the brown rice in the filling. Oh this looks so yummy, I’m making this for dinner tonight. The family will be very pleased!! Looks very good. Am the only one here who likes cabbage. This looks like an awesome recipe. I’ll have to try it some time. I have the 5 qt IP. Will your recipe fit in it ok or do you think I should make some adjustments? I am eager.To try your recipe. I love cabbage rolls and have never .Ade them before. This recipe sounds yummy. I’ll have to try it soon! I recently bought a second, larger electric pressure cooker. My last one had a non-stick interior which was ruined by the metal trivet it came with! This time I purchased a silicone trivet/steamer that fits perfectly. I even used it to make your egg custard recipe using a 1.5 qt. Corningware dish. Your egg Custard recipe (made 1/2 at a time was PERFECT for my husband, our daughter and me! (& absolutely SCRUMPTUOUS, too!) Thank you so much!! I prepped this yesterday to cook tonight. I used 2 lbs of meat (becuSe I had it) and my 6 qt pressure cooker is packed. I had to remove some sauce from the top so it wasn’t above the Max line. Do you think I should add extra cooking time? It should all be fine. Because the cabbage will shrink up so much and your end result will be lower than where it is now, I wouldn’t worry so much about the max fill line. This is not boilerplate language and I am only talking about this recipe. Do you put the entire lemons in the sauce or just the juice? I tried making this tonight. The pressure would not come on — we tried adding more liquid. Still wouldn’t work. Finally, we removed all the cabbage leaves and onions from bottom and it finally worked! I made these tonight and woweeeee!! I split the meat 50/50 ground beef / bratworst and added raisons to the layers in the cooker. The sauce is to die for! Thank you for sharing I have a new favorite!! This looks like a delicious recipe. I have always liked stuffed cabbage and remember the way that my grandmother and mother made it when I was a child. I would probably add more sugar because I like it on the sweeter side. Just want to make sure I understand the recipe correctly. If I use white rice it goes in raw, is this correct? Also 9 minutes does not seem like a very long time to cook the raw turkey, rice, snd cabbage.. I am assuming it takes a while to come to pressure, but I’m curious as to how long it might take to come to pressure. Lastly, I’m curious if the Cabbage will come out fork-tender. I have elderly parents who are in their 90s and their teeth aren’t that great. Even as a child I remember my dad commenting that the Cabbage was too tough when my mom cooked stuffed cabbage. So it would be great if these roles came out nice and tender. Thanks for answering my questions. Can’t wait to try this recipe. Can’t wait to try this! I love stuffed cabbage! Could you pressure cook the cabbage on the night before and allow it to cool overnight to speed up the prep process on cooking day? I can’t wait to try this recipe – a real blast from my past! My mom used raisins, so that’s what i’ll do. One thing, though – the Eden Roc and the Fountain Bleu were the height of elegance to my grandparents who also spent the winter in Miami Beach. Your grandma must’ve been a classy lady! What would they think of South Beach now?